When it comes to the latest machines to roll out of the factory on two wheels, the internet is rife with review articles. This is great if you are looking for a new bike, but what if you are looking for something in the used market that pre-dates the world wide web by, say, a couple of decades or more? If you are lucky you might turn up an old issue of Cycle World that has been digitized and contains a review of the motorcycle you are interested in, but some of the information will certainly be dated and Cycle World only goes back to 1962. 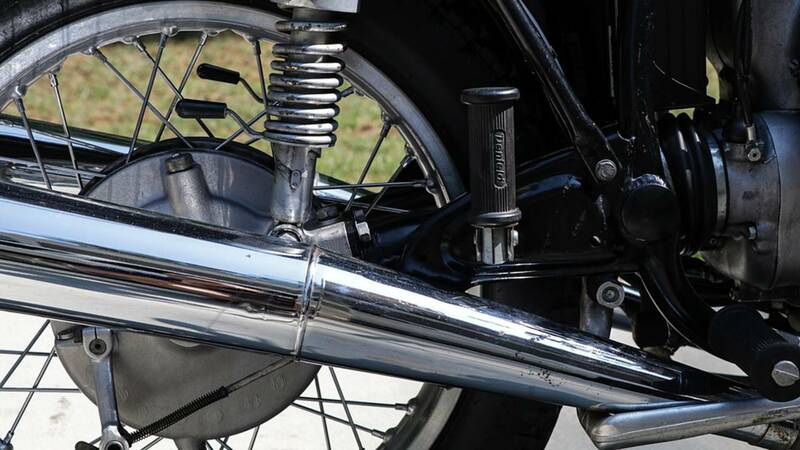 When it comes to motorcycle engines, BMW's opposed twin is easily the most recognizable from any angle. Bayerische Motoren Werke AG, which we all know by its initials, BMW, produced its first motorcycle in 1923. The company itself had been founded in 1916 as an aircraft engine manufacturer for the German air force, but with the banning of German aircraft by the Armistice at the end of World War I, BMW moved production to industrial engines in 1921. 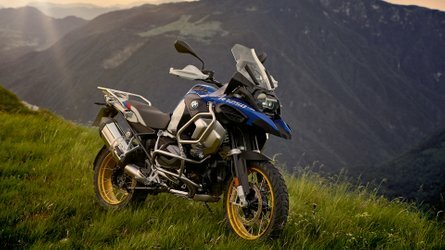 Several motorcycle manufacturers used BMW's industrial engines as powerplants for their own bikes and it didn't take long for BMW to realize the profitability of building motorcycles themselves. Chief engineer Max Friz designed the powerplant for the first BMW motorcycle, the R32. This engine design, nicknamed the boxer, has been the foundation of all opposed twin BMW motorcycles, including the R75/5 and many of the machines in BMW's current line-up. The revolutionary design of the BMW engine has often been copied, including the XA which was manufactured by Harley-Davidson during WWII. BMW's commitment to the armed services continued into World War II, where it produced thousands of machines for the Wehrmacht. The post-war years were rocky ones for BMW, which at one time had plants on either side of the Berlin Wall, both using the name BMW. By 1970, things were starting to look up for BMW and they released a new product line called the /5 series which included the R75/5, the R60/5 and the R50/5. All three of these models were produced until 1973 and were the first machines completely produced at the Berlin plant, as the plant in Munich had switched to automobile manufacture. New for the 1972 model year was the 4-gallon "toaster tank" with chrome side panels. This two-year-only tank really sets the /5 series apart from every BMW manufactured before and after, adding a lot more "pop" than you typically associate with BMW. 1972 was also the last year for the short wheel base models, as the wheelbase was extended by 2.5 inches in 1973 to accommodate a larger battery box and to improve handling. 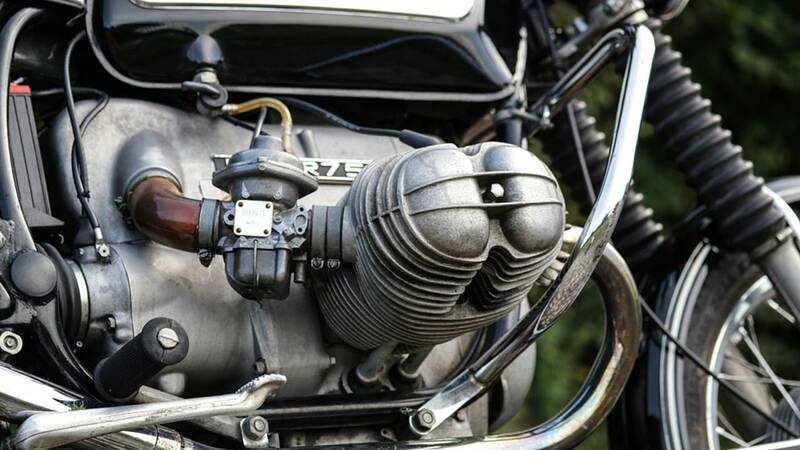 The heart of the R75/5 is a 745cc opposed twin engine. 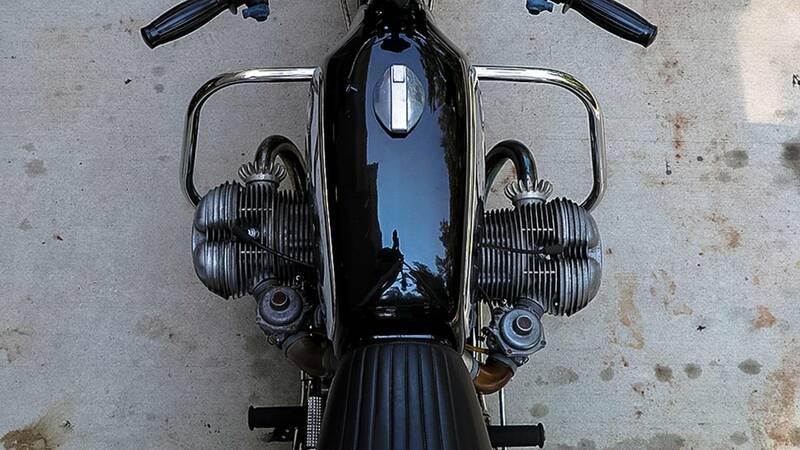 While the design at first seems awkward - with the cylinders sticking out of the sides of the motorcycle - it actually provides a number of advantages over your typical inline V-twin or single-cylinder engine. Right away I'm sure you can guess that the cylinders cool better and the center of gravity is lowered for improved handling. 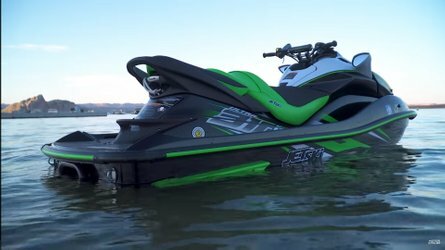 What is not as obvious is that this design allows for the camshaft to be mounted under the crankshaft for improved lubrication and higher ground clearance. From above it is obvious that the cylinders are actually offset and not directly inline as one might assume. The cylinder heads use hemispherical combustion chambers with pushrod actuated overhead valves and are fed through dual 32mm Bing CV carburetors. For those unfamiliar with carburetors, the "CV" stands for constant vacuum which is a design that uses a rubber diaphragm to maintain the correct air/fuel mixture despite changes in altitude. Before this improvement, one would have to manually adjust the mixture of the carburetor (while riding) to accommodate for changes in altitude. 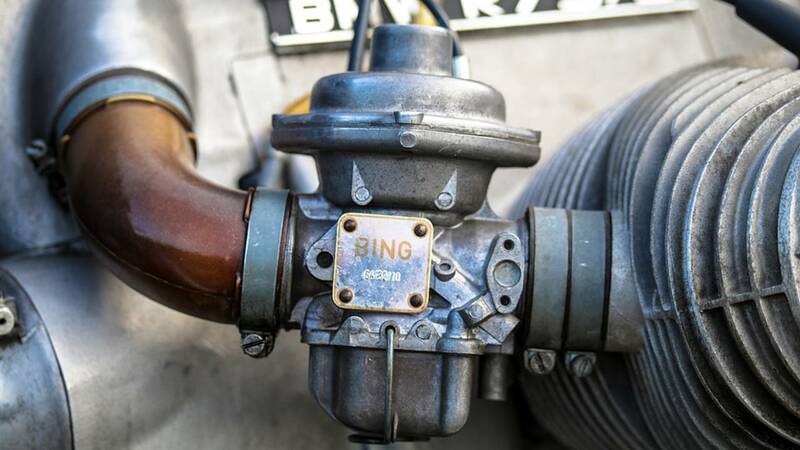 The round section at the top of the carburetor houses the diaphragm that creates the constant vacuum. Since the crankshaft is in line with the frame, the four-speed transmission is directly connected to the rear of the engine via a single disc dry clutch. This arrangement eliminates the need for a chain or belt to connect the two main drivetrain components, making for less moving parts, reduced maintenance, and a smoother transfer of power from the engine to the transmission. 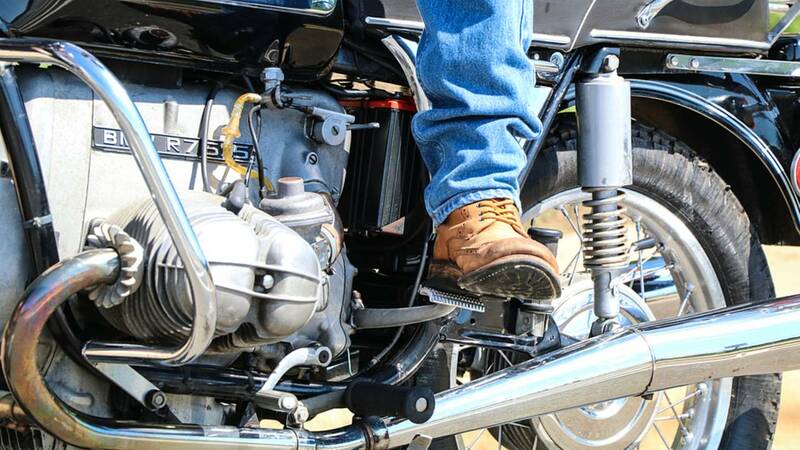 With both the crankshaft and transmission in line with the frame, the kickstart pedal's movement is perpendicular to the motorcycle. Continuing with the inline geometry, the rear wheel is powered by a right side driveshaft, which connects to the transmission via an universal joint. Covered with a rubber boot, the universal joint allows for rear suspension travel while staying constantly lubricated with fluid. The other end of the driveshaft uses bevel and ring gears to convert the shaft's rotation to spin the rear wheel. By enclosing the entire rear drive system, there is no need for constant cleaning and lubricating as with a chain. Also there are no adjustments that need to be made since the driveshaft doesn't stretch over time. Both the enclosed drive shaft and final drive use their own fluids which must be precisely maintained. The braking system on the R75/5 is just what you would expect from a motorcycle produced in the 1970s: cable/shaft operated front and rear drum brakes without any hydraulic assistance. The rear drum brake is your typical single brake cam design that attaches directly to the foot pedal via a solid rod. When adjusted properly it is capable of easily locking up the rear wheel and does a reasonable job of bringing the bike to a stop. 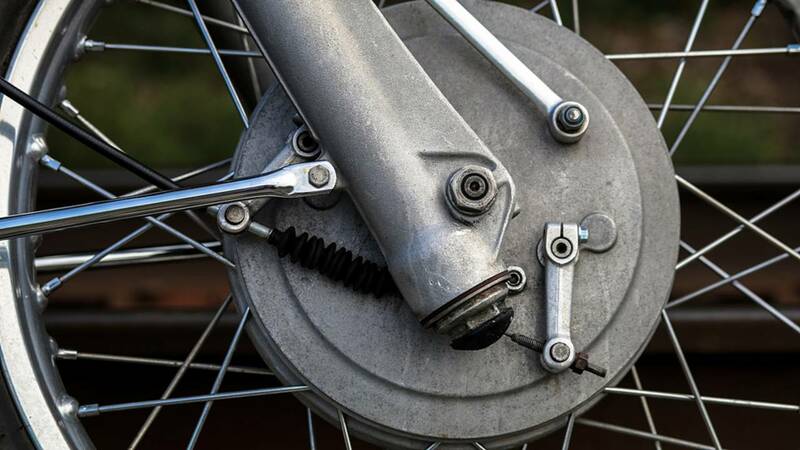 Just like a modern bike, the real stopping power on the R75/5 comes from the front brake. Unlike the rear, the front brake uses a dual leading shoe design which is actuated by two brake cams. This design dramatically increases braking power to the point that you have to be careful not to grab the front brake too aggressively when stopping. Two levers operate the dual brake cams simultaneously when the front brake lever is pulled. The suspension is made up of telescopic forks out front and a pair of standard coil over shocks in the rear. The rear shocks also feature three preload settings which allow you to tune the suspension based on riding solo, with a passenger, or fully loaded. While the front suspension is completely rebuildable, the rear is not, so if you are riding an all-original machine chances are the rear suspension is going to be a little bouncy. 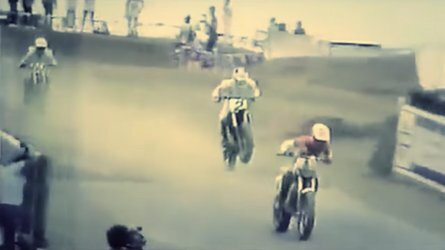 Also it is important to keep the front forks filled with the correct fork fluid to help compensate for front end dive caused by those excellent front brakes. 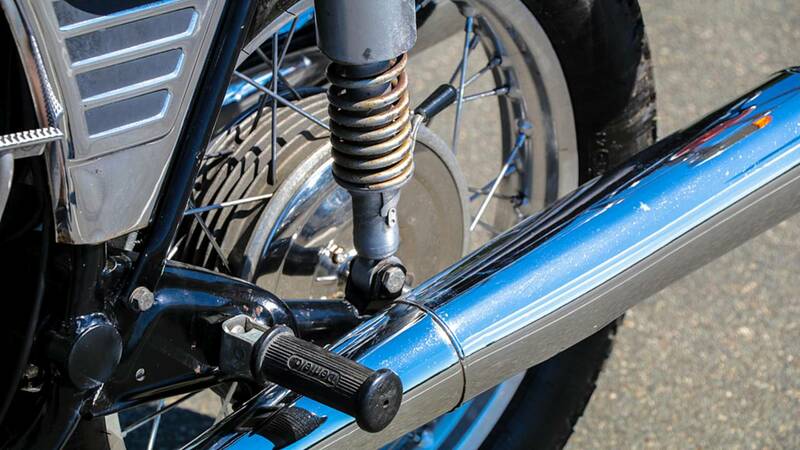 A built-in lever makes changing the preload on the rear shocks a quick adjustment. The R75/5 rolls on 3.25x19 tubed tire on the front and a 4.00x18 tubed tire on the rear. These are mounted to spoked alloy rims manufactured by Weinmann. 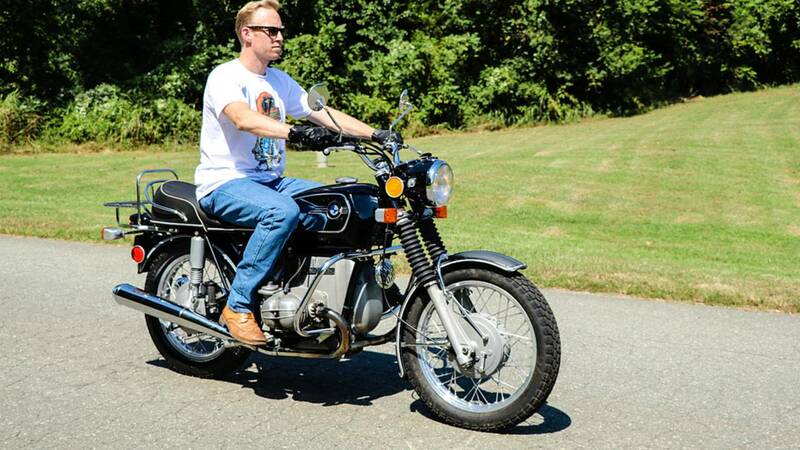 Most of the R75/5's controls are the same as any modern motorcycle. It uses a left-side foot shift (1 down 3 up) and left handlebar-mounted cable-operated clutch lever to perform gear changes. The brakes are operated with a right-side foot pedal for the rear and a right handlebar-mounted brake lever for the front. An adjustable steering damper is located just forward of the gas tank, which allows for quick adjustments to the tightness of the steering. The steering damper is easy to reach right between the handlebars and allows for quick adjustments while riding. The electronics include an unusual ignition key which doubles as the headlight/parking light switch. 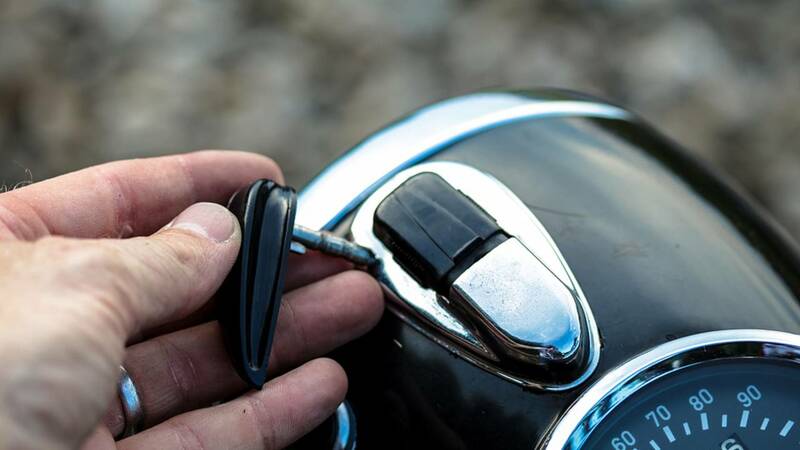 The ignition key fits into the front of the headlight and then can be turned left or right to turn on the headlight or the parking light. 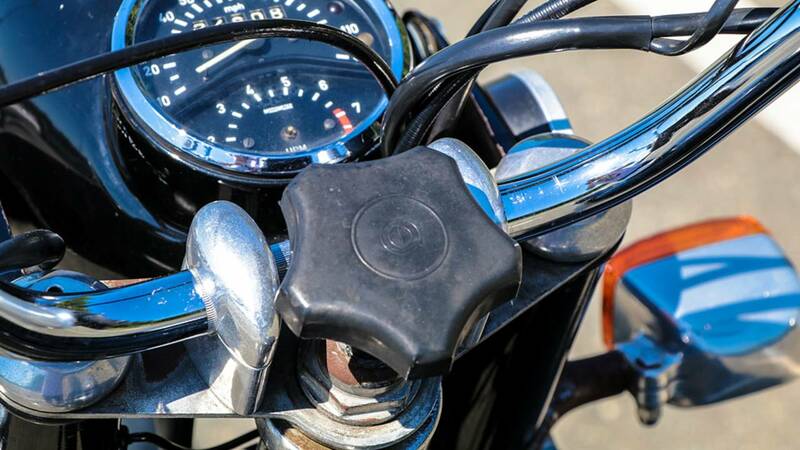 On the handlebars are integrated switch/buttons that operate the horn/highbeams on the left and the turn signals/starter on the right. Mounted in the headlight bucket is the only gauge, which has individual lights to indicate high beams, neutral, low oil and low battery, along with an analog speedometer and tachometer. 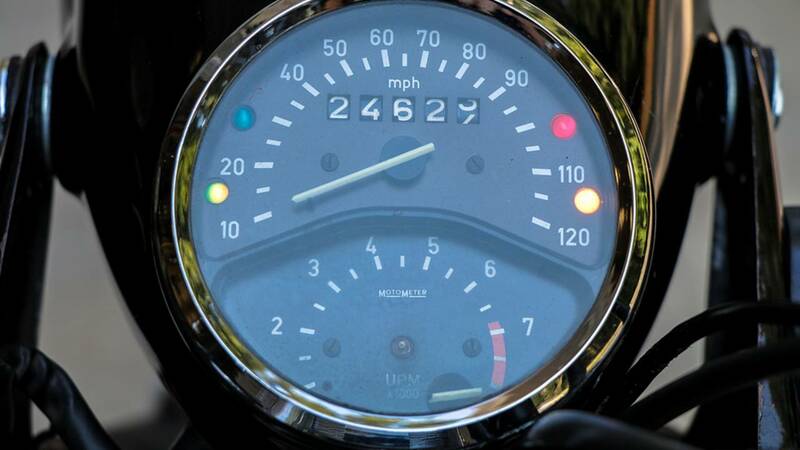 The needle on the tachometer is rated for 25,000 miles or 40 years, whichever comes first. 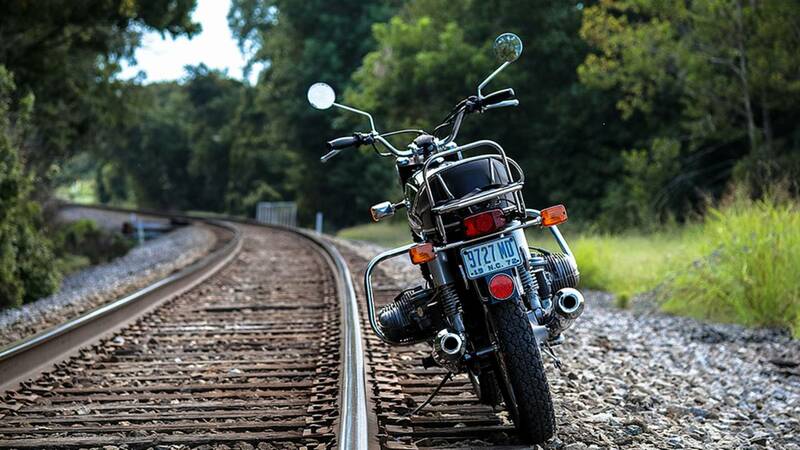 When you sit on the R75/5, the first thing you'll notice is the seat height. 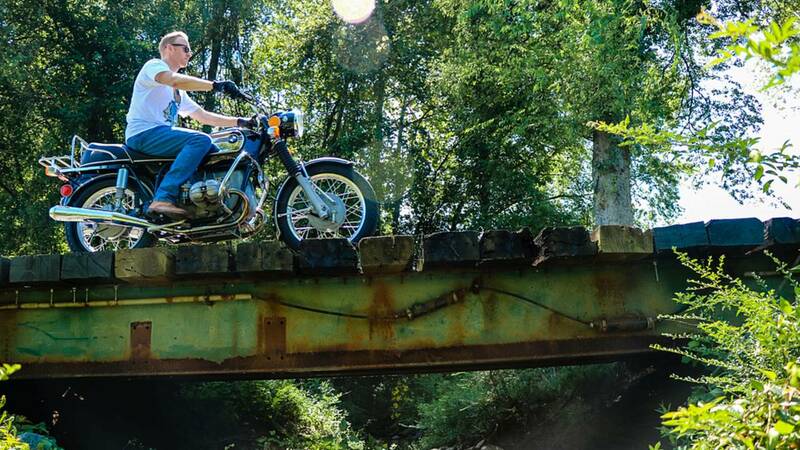 At over 33 inches, it's a bit taller than most vintage motorcycles and the result is a feeling that you are riding on top of the bike, rather than in it. 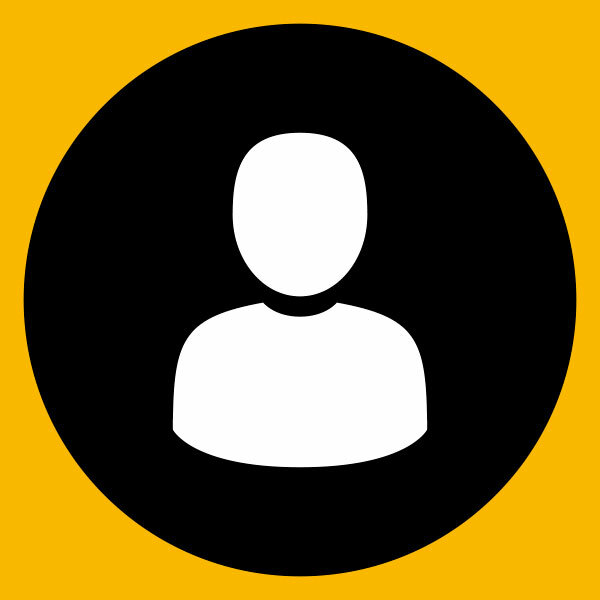 The riding position has you sitting with a straight back and your arms stretched forward. Your thighs are positioned nearly parallel to the road and your lower leg is angled back to accommodate for the engine cylinders. Overall, this is a very comfortable riding position and helps to inspire confidence when riding more challenging roads. The bike weighs in at under 500 lbs. and with the low center of gravity, plus the neutral riding position, it is very nimble and easy to handle. 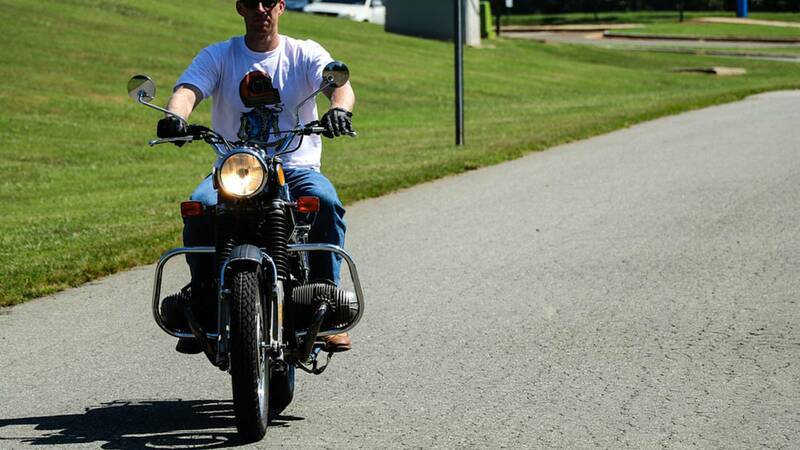 The upright riding position is very comfortable, even after long hours in the saddle. 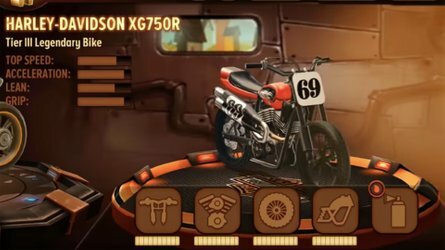 The boxer engine produces 50 horsepower and 43 foot pounds of torque, so this bike can actually keep up with its modern counterparts. While you're not going to dust any sport bikes, you can give a new Sportster a run for its money and, more importantly, you can travel at normal highway speeds. BMW's engineers did a good job selecting the gear ratios on the transmission as you have plenty of power off the line and can still get 50 miles per gallon while cruising down the freeway. I've always heard that shaft drives have a tendency to torque steer, or pull to the right under hard acceleration, but I did not experience this during my ride. 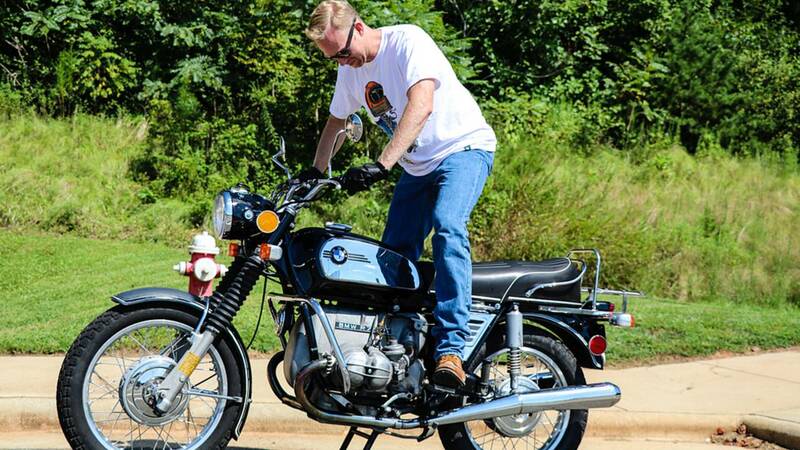 The top speed for a stock R75/5 is an impressive 109 mph. The bike feels very solid on the highway and doesn't vibrate a tremendous amount like many old motorcycles, so your hands and feet don't go numb after an hour on the road. It would be nice if you could stretch your legs forward, but there is no getting around those two cylinders. You can lay your legs on top of the cylinders, but I noticed that moving from that position back to the foot pegs is rather awkward and would be problematic if you need to shift or brake quickly. I've seen a couple /5s with highway pegs mounted on the crash guards, but your best option is just to keep your feet on the factory footpegs. The powerful acceleration paired with the low center of gravity makes it great to ride in the twisties. My initial thought was that the cylinders would scrape the ground in tight curves, but with 6.5 inches of ground clearance, you would really have to work at hitting the cylinders in a turn. 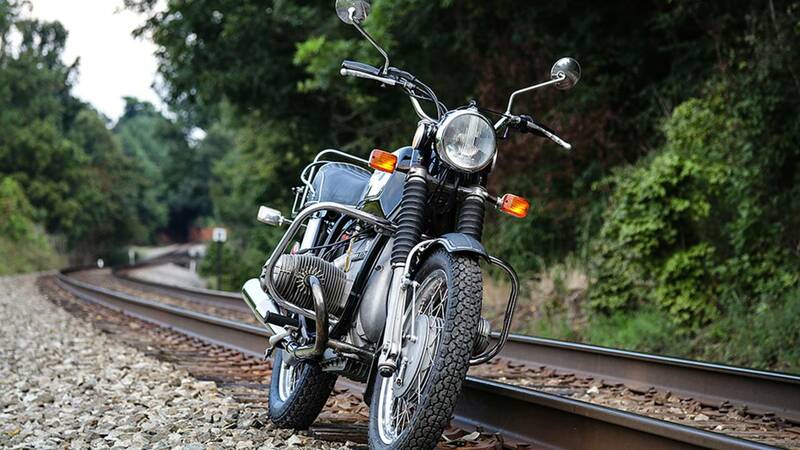 The high ground clearance also makes the R75/5 a capable off-road machine. As mentioned above, the front brake is what you really have to watch out for. Pulling it too hard will definitely lift you off the seat if you are not paying attention. I am used to most vintage bikes, which have front brakes that are only able to hold the bike at a stop light, so the R75/5's set-up took a little getting used to. The other issue I had was with the side stand. The spring is so powerful that even when fully extended the side stand will snap back as soon as the bike is tilted up. On one hand, this is great because you can never ride off with the side stand down, on the other hand it makes it difficult to use as you have to hold it forward with your foot until the weight of the bike has transferred over to it. The addition of a center stand is a must-have option and will save you from dumping the bike in the parking lot while trying to operate the side stand. 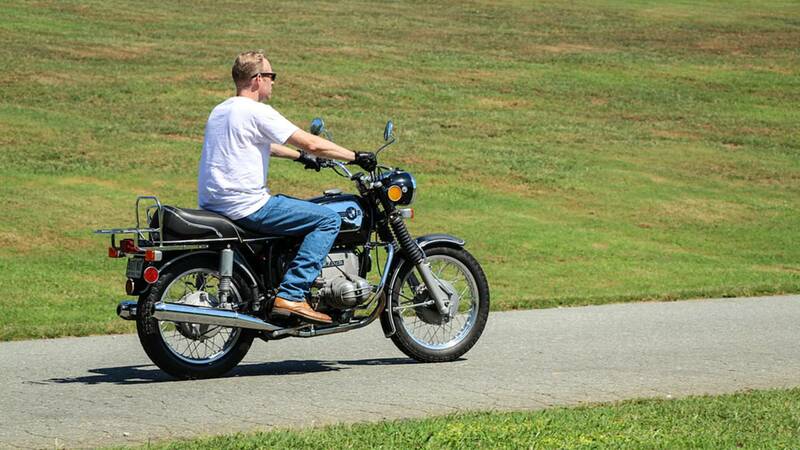 Overall, the R75/5 is an excellent machine. It achieves what most of the new retro-styled bikes are going for: classic looks with modern handling. While there is certainly more work needed to keep an old BMW running than something that just rolled off the assembly line, the parts are readily available and most of the routine maintenance can be performed with a good shop manual and the factory tool kit. 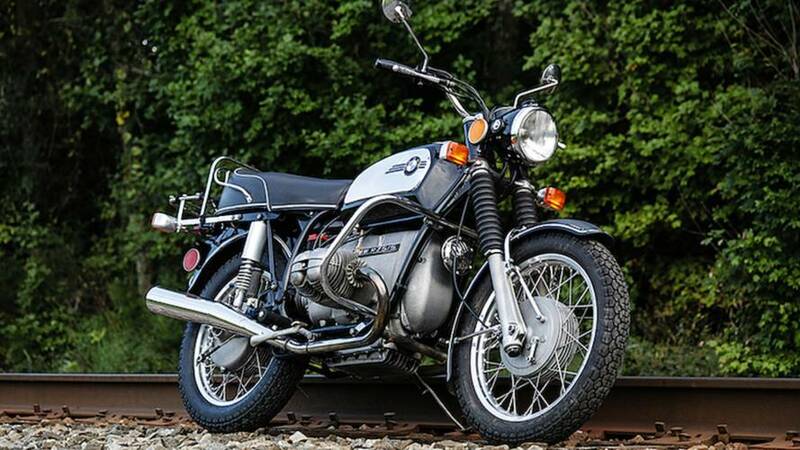 If you are looking to add a classic motorcycle to your garage, then you can't go wrong with the R75/5 as it really rides and operates just like a modern motorcycle while projecting the rich history of BMW.